I know three things for certain. First, I love my RV. Second I love food. Third, I’m a lousy cook! For all three reasons, I knew I needed the best RV microwave money could buy. Like most people, sometimes I just don’t want to turn on the stove or oven to make dinner. Some nights I want to easily make popcorn to watch a sunset or a movie with my family after a long day outside. It just makes sense to have a microwave in the RV! With so many options available, however, selecting the right one proved challenging. How can you know which microwave will work best for you? Nobody wants a microwave that doesn’t last or won’t heat thoroughly! So I gathered the five best I could find and did a side by side comparison, so you don’t have to. I’ve tried to give you a glimpse into the technical specifications of each, why I liked or disliked them and the pros and cons of each model. Here are the five RV microwaves I tried and what I thought of them. The smaller size fits well in RVs where counter space is at a premium. Low wattage and manual controls reduce power consumption. Easy to operate by anyone, even children, seniors or the visually impaired. It has buttons for the most popular cooking options. Defrost functions are great for those who can’t leave frozen food out to thaw. Runs quietly and the beeping alerts aren't obnoxiously loud. The vintage style looks great, and would especially fit the decor of a vintage RV. I love having a button to add 30 seconds of cook time. The five power levels and four auto-cooking functions give you lots of options. Optional power save mode lets you decide if you want to use standby or not. Accurate pre-programmed cooking options make preparing popular choices a breeze. Touch screen has the right level of sensitivity. The microwave feels sturdy and heavy duty. The Westinghouse Counter Top Rotary Microwave Oven may not have all the bells and whistles of other microwaves, but it has everything that you need in your home away from home. With space always valuable in your RV, you won’t get frustrated with this smaller size. You will find it easy to operate, and great at warming up or preparing small dishes and meals. You won’t fit large platters in this unit, but most microwave safe plates, cups and dishes will fit without issue. You can clean it easily, and since the Westinghouse has no electronic controls, it uses no electricity when not heating food. The different power levels give you the option to defrost, reheat, or prepare a frozen dinner depending on your needs. You adjust the power level and cook time by turning dials, which makes for incredibly simple use. It easily mounts in cabinets or takes up little space on the counter. Because this unit doesn’t have any digital buttons or screens, it draws no power when not in operation, and doesn’t eat up too much power even when you do run it! I don’t want to use my generator if I don’t have to, and less power draw helps. Despite its small size, it stays put — no sliding around on the counter when you open the door to put things in or take them out. The simple design makes it easy for anyone to use; no complicated programming or extra buttons! To set the microwave you turn a knob to the estimated cooking time, which is a little imprecise. The microwave stops cooking when you open the door, but if you remove food before the cook time ends, the microwave will resume cooking when you shut the door. You may have to add a minute or two to your cook time and stir your food to ensure even heating — which is pretty common in smaller and lower wattage microwaves. The timer knob makes precise cooking difficult. May require an extra minute or two of cook time and stirring to get even heating. The unit will run empty if you remove food before cook time ends. If you prefer a one-touch cooking experience, you may like this Danby Microwave Oven. It offers six different automatic settings for popular uses, as well as three specialty programs. These options let you decide if you would like to cook your food by weight, defrost by weight, or even speed defrost your food. You have a little more size in the Danby, so if you cook with larger dishes, this can benefit you. Operating at 700 watts, this microwave still doesn’t draw too much power, but the LED clock and timer will use a small amount of electricity at all times. I like that the Danby offers the most popular cooking options at the press of a button. No need to mess around with settings and timers when I just want some popcorn or to reheat some pizza! Defrost by weight and speed defrost functions provide a great option in an RV since you may not have lots of counter space to thaw food. The beeping alerts are a pleasant volume and the fan isn’t too loud either — nice when in a small enclosed space. The Danby doesn’t vent moisture very well. Lots of condensation will form inside while cooking, requiring you to wipe out the microwave after every use. If you don’t remove the moisture unpleasant smells will accumulate quickly, and then they’re hard to get rid of! After setting the timer and starting the microwave, the timer doesn’t show you how much cook time remains! The screen reverts back to the clock, and to see how much cooking time you have left, you have to press a different button. It retains moisture, which will lead to unpleasant odors if not wiped out after each use. The timer won’t show how much cook time remains. If you like retro or vintage styling, you may find yourself drawn to this Daewoo! With a lot of different color options, this appliance exudes personality and makes a fun statement. It would look especially great in a vintage airstream or similar RV. It works well at reducing unnecessary power consumption with a zero standby function — meaning it draws no power when in standby mode. With five power levels, four auto cooking options, and an automatic defrost setting, you have a lot of options for preparing food with this microwave. Add on a child safety lock, and you know that nobody’s toys will end up getting nuked! Beauty may be only skin deep but the retro look of the Daewoo really draws me to it. It offers a cool blend of modern tech built into a classic design, and I appreciate that. The zero standby function is a great power saving option, and the child safety lock helps if you have kids or grandkids that have a habit of getting into trouble. The user manual is one of the most thorough I’ve ever gotten with an appliance; it might be overkill, but I appreciate it! It as a button for adding 30 seconds to your cook time. It’s a simple thing, but I think it provides a helpful option for adjusting cook times. Though I don’t expect a 700 watt microwave to pack tons of power, it cooks more slowly than other similarly powered units. Though I think that the zero standby function is great, I will admit that I would get weary of having to turn the microwave on every time I want to use it. Also, if you don’t clear any remaining time, the microwave will not go into standby mode, reducing the usefulness of that function. Mostly, I don’t like Daewoo’s warranty for this microwave. 30 days is a very short window for something to go wrong, especially if you don’t use your microwave every day. You do have the option of purchasing an extended warranty, but I feel a company should stand by a product for more than 30 days without consumers having to pay more. Cooks slowly, even for a 700 watt microwave. Standby mode won’t come on if you don’t clear remaining cook time. I’m very disappointed in the 30 day manufacturer warranty. If you have a little more space, more power available and have more cooking needs for your microwave, this Toshiba might work for you! While larger than the previously reviewed models, it still fits well in smaller spaces especially if you have extra counter space. The digital display and interior lighting are supplied by LEDs, which require less power to operate. You have the option of using the standby mode if you want to, and can silence the alert tone if you prefer, which families will appreciate. At 900 watts, this microwave cooks more quickly than previously reviewed models, but does draw more power when used at higher settings. Six programmed functions provide easy use for popular options, and ten power settings let you determine how much heat you use. The Toshiba cooks very evenly, and more quickly than other options. The programmed functions work as intended without having to make too many adjustments. You can turn off the tone that alerts you when the microwave finishes cooking, which is great in a small shared space, like an RV. The child lock works well at keeping kids from getting into hot food. I like that the power save mode is optional, and that the interior lighting is a power-saving LED. These give me options for reducing power consumption, but let me decide how to use them. The turntable comes off the track too easily. When removing items from the microwave, I found I would easily reposition the plate on accident. The pre-programmed options provide easy use, but trying to program your own specifications for cooking requires a lot of button pressing. When operating the microwave, the fan can get very noisy. Sometimes it sounds like a small plane taking off! The fan makes a lot of noise while in operation. Trying to specify cook time and power level requires too many button presses. The turntable comes of the track way too easily. Right away I noticed that the Panasonic had no turntable! Confused at first, I quickly realized that this microwave works differently. The Panasonic has no need to rotate your food using a tray, instead it uses a bottom energy feed system meant to have better and quicker results. This microwave comes with ten preset timer settings, various program buttons available, and ten programmable memory pads so that you can have a setting for your favorite foods. The Panasonic has a little more size and weight than other models, weighing in at almost 40 pounds. This microwave is meant more for commercial or communal use, but I’ve heard good things and wanted to give it a try. The Panasonic cooks quickly and evenly. While thrown off by the lack of a turntable at first, I’ve come to like the fact that it doesn’t need one — that’s one less thing to clean or worry about! The touch screen reacts very well to light pressure, and the preset timer settings have been very handy for general heating and light cooking. While the unit has more weight, it feels heavy duty and I don’t feel like I need to worry about it incurring any damage. While the preset timer settings work well, trying to use 20 programmable menus gets complicated quickly! I find the buttons on this model confusing in general, as the layout is unlike any other microwave I’ve ever used. The alert tone when the microwave finishes cooking could wake the dead! Especially in an enclosed space like an RV, you simply can’t avoid a shock when the tone goes off. You do have the option of turning off the beeps, but I found that when you switch programs, it would often reactivate itself. The blank front panel always appears to be unplugged or turned off, and with the functions so difficult to use, the chances of burning food are high. Power settings are confusingly indicated by an inconspicuous LED light that cycles between hold, high, medium high, medium, low and defrost. The alert tone is the loudest I’ve ever heard! I found it very difficult to use most functions, and burned a lot of food in the process! People have a lot of questions about microwaves for their RVs! I can’t blame them either, with so many options available I too found myself confused about what I needed. To help you make your decision a little easier, I’ve answered a few questions that I frequently get asked regarding microwaves for RVs. - Can a household microwave be used in RVs? You absolutely can use a household microwave in your RV, but you do need to consider how much power it uses and how much power you can provide. If you have a dedicated circuit for the microwave, you have fewer worries. If not, I’d recommend limiting using other appliances while using your microwave. No blow dryers or air conditioning, or else you may find yourself flipping breakers! I’ve tried to limit the microwaves in this review to models that don’t draw huge amounts of power so that they will work well in a number of different RV classes. - Is an RV microwave just for a little reheating or can I cook with it? This depends on a few factors, including the microwave you select, how much power you provide, and cook times. All microwaves will do a solid job of reheating leftovers, and all of the ones in this review will do a good job of basic cooking, though you may need to increase the cooking time. I’ve found that smaller microwaves, like you would want in your RV, do a fine job cooking — they just do it a little bit slower than the larger, more powerful microwaves we typically have in our houses. - Does an RV microwave need to sit on a countertop or can it be added to a built-in cabinet? I have seen microwaves in both positions in RVs, and have experimented with both. I prefer them in a built-in cabinet because it prevents them from moving, and frees up additional counter space. You can mount a microwave to the counter like you would in a cabinet, but I prefer not to. If I need to move the microwave, the mounting hole remains. - Do you need a certain type of cookware? Your RV microwave will work like any other microwave you’ve used. You can cook in any microwave safe dishes or cookware. Size will be a bigger factor in your RV, however, so make sure that your dishes will fit in your microwave. I know how hard it can be trying to find the best RV microwave — I struggled with it myself! That’s why I wanted to do a comparison of these options. I love my RV life, but I want to make sure I don’t always have to turn on the oven or stove, especially on those hot summer days! 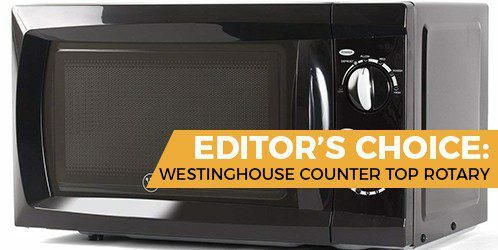 All of the reviewed microwaves have their pros and cons, but if I had to recommend just one, I’d go with the Westinghouse Counter Top! It provides reliable cooking in a small package, and size remains a huge deciding factor for most RV owners. Though it lacks the power of some other models, it also requires a lot less electricity than other microwaves, and uses none when not in operation — without relying on a complicated standby system. It’s simple, easy to use and heats food evenly and reliably. All of which makes it the best RV microwave I would recommend.